Fiestaware was also produced commercially. 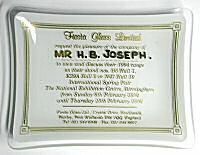 These often took the guise of dishes or ashtrays and allowed companies to advertise their products. Often companies would sell the item	as	a souvenir, like the Tussaud's dish below. There are probably thousands of different examples and it would be impossible to list them all, so we have 'cherry-picked' a few nice and unusual examples. Please also note that the USA company Houze was also very prolific in producing 'Adware' and 'Mottoware' that looked remarkably similar to Chance's versions. The	one	big distinguishing feature	between	the	two	makes	would	appear to be that Chance printed	on	the	underside	of the dish and Houze	on the top	surface. A very classy 'calling card'. In this case it was an invite to Mr. H.B. Joseph to view the exhibits on their own stand at the NEC This was produced for an exhibition at Blackpool, 10th Feb. 1967, inviting people to visit the 'What's New' room. 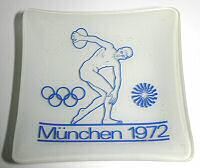 These Olympics, of course, were unfortunately better known	for	the	murder	of	Jewish	athletes by Palestinian radicals.